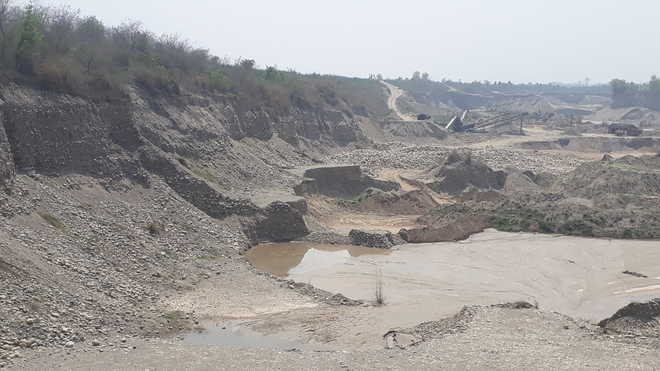 The district authorities have swung into action to put a ban on the illegal mining in Tajewala village that has damaged a portion of the right lower down-stream embankment (RLDSE). The excessive and uncontrolled illegal mining has increased the threat of breach in RLDSE and damage to the Hathnikund barrage. Haridev Kamboj, executive engineer, Water Services Division, Dadupur, said he had directed Dharampal, sub-divisional officer (SDO) of his department, to lodge a complaint with the Pratap Nagar (Khizrabad) police for registration of a case against owners of 14 screening plants and one stone-crushing unit being run close to the RLDSE in Tajewala village. He said the SDO along with junior engineer Hemant Kumar had inspected the RLDSE on April 11 and found that illegal screening plants were operating there. “The SDO and the JE found that no mining block was granted after auction to any firm by the state government in the Tajewala area. Several screening plants were promoting illegal mining in the area,” said Kamboj. Sanjay Simberwal, assistant mining engineer, Yamunanagar, said a team of his department was keeping strict vigil in the Tajewala area and had impounded six vehicles found involved in illegal mining in this area yesterday. Meanwhile, the Haryana State Pollution Control Board, Yamunanagar, has recommended the closure of eight illegal and six legal screening plants to the higher authorities of the board. “As soon as we get permission from the higher authorities, we will immediately close down the operation of all 14 screening plants,” said Nirmal Kumar Kashyap, Regional Officer of the Haryana State Pollution Control Board, Yamunanagar. Haridev Kamboj said 14 screening plants and one stone crusher were installed violating rules as no mining was permissible in an area up to a width of 500 metres from the active edge of the Yamuna embankment. “The excessive and uncontrolled illegal mining may cause a breach in the RLDSE,” said Kamboj. State Congress spokesman Satpal Kaushik said illegal mining in Tajewala had put at risk lives of people of the area. “Illegal mining is a big scandal. In the past four years, the mining mafia committed theft of minerals worth more than Rs 3 lakh crore in Yamunanagar district,” he alleged. He demanded a CBI probe into illegal mining in Yamunangar district.